Ophone bouf is beef, eh? and do you mean rouge, red? But be secure, the cheese only has that name, it's not made out of red boys! But be secure, the cheese only has that name, it's not made out of red boys!. Favourite food... it's a hard question all the same! Yesterday was our "Christmas dinner" (lunch in fact ) at school... excellent! From the entrée to the dessert, all was just delicious (particularly the dessert "absolu chocolat" ) ...and we had so many choices! Well, I forgot to post about a visit to my favorite restaurant last weekend. And I just had a flashback of my profiteroles! dark chocolate sauce over cream puffs with a cream filling, dusted with powdered sugar. 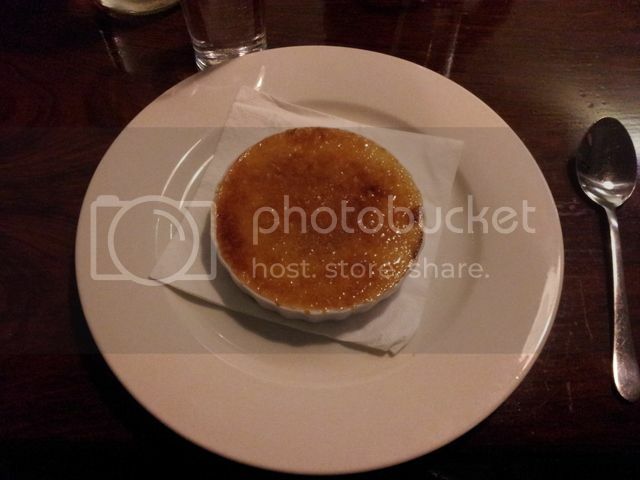 I went out to dinner last night for a relative's birthday and got to have Creme Brulee for dessert for the first time! I always wanted to try it and it totally lived up to my expectations - it was divine!!! yummy! I'll bet that creme brulee' was good CosmicLea! Gosh, that just looks so good! Aaaaaaaaaw I absolutely love, looooove that dessert!! !It's so........ Mmmmmmmm! Sweet, Salty and Almonds hun? Sounds like a great combo! caroli wrote: Sweet, Salty and Almonds hun? no no no my "huh" means "disgusting" and my "hun" means "right?" yes, when she says "hun" I think it means "huh" to us!! Like "right". caroli wrote: no no no my "huh" means "disgusting" and my "hun" means "right?" Okay, so in English "huh" and "hun" have different meanings, so is that how you say it in Portuguese? yes, wine grapes and eating grapes are different! what grape do you have Caroli? I've been into Avocado's a lot lately..I eat at least 4 a week. That and Figs...I love Figs! ooooohhhh! Cabernet is my favorite wine! Maybe mixed with a little Merlot! MMMmm avacado -it is a superfood. It's unique and good for you. We wanted to put some Merlot...we are testing If it will resist with these conditions..
Yummy honey! Pooh bear was onto something!